Personalised with up to 6 lines. Free Gift Box. 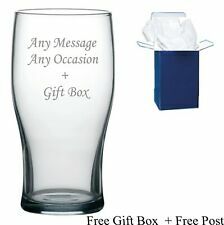 Personalised Engraved Pint Beer Glass Tankard FREE Gift Engraving Any Occasion. engraving holds no colour outline cut in to glass. Enjoy your favourite Miller Genuine Draft beer in your favourite Miller Genuine Draft tankard 16-oz glass tankard has the iconic Miller Genuine Draft logo in black on the front - so there will be no mistake what you want to drink! Beer Tumbler. Beer glass has a picture on one side with the words. Mug is by Activision. Collectors Glass. Call of Duty. "Call of Duty" and "Infinite Warfare". Great gift for any Call of Duty fan. party bag filler, whole sale and much more. The brewery is currently the fifth largest in the world. 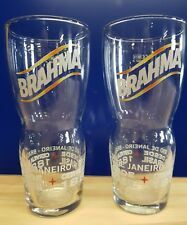 2 x Brahma Brazilian beer Pint Glasses New. However should you have a problem just get in touch and we will resolve any issues. Suppliers of breweriana and other drink related products to both the trade and general public. Personalised Pint Dimple Effect Tankard. No extra text can be included, just as pictured. Text allowance. WICKED WILLIE MAN'S BEST FRIEND I'M IMPRESSED' 1pint glass beer mug ADULT HUMOUR FUN BIRTHDAY/STAG GIFT Gray Joliffe collectable from 1984 Great hard to find real fun item in excellent condition with no chips, cracks or marks. Man's Best Friend books and the WICKED WILLIE character was very popular in the early 1980's and has now become collectable. Please see pictures for best description. I am as honest as possible with my descriptions, if you have any questions then please feel free to ask. Thank you for looking. UK mainland postage only. The glass will be posted to you within 2 working days of payment being received and cleared. Personalised Pint Dimple Effect Tankard. Text colour no colour just engraved into glass. 5x lines 15 characters each line inc spaces. 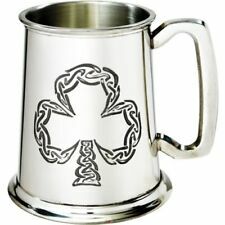 This stainless steel tankard holds 1 pint / 560ml and is adorned with a pewter emblem. Standing 12cms high and weighing 790g the glass is comfortable to hold and a pleasure to drink from with its contoured lip. To ensure clarity your lettering will be diamond-cut into the glass - we do not laser. ONLY FOOLS AND HORSES DAVES TANKARD RODNEY BEER GLASS. Dave's Tankard. Cosmic Gifts have been established for over 25 years. Providing new and unique gift solutions for any event. Supplied in a gift box. Personalised with up to 6 lines free. This item is a Large 23 fl oz Size Heavy Base Stern Glass Tankard. Personalised with up to 6 lines free. 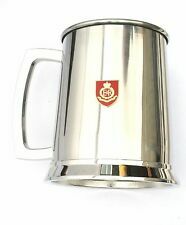 Personalised 1 pint pewter tankard in a Hallam style with brass trim. 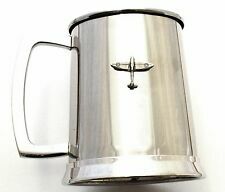 Tankard size: 120mm x 125mm x 90mm. (maximum of 75 characters). An image of Fonts can be viewed below. If you do not choose a font we will choose one to suit the item. Dalex tankard, capacity of a half pint. Silver plated, of rising tapering form. Silver Plated Tankard. "SS "South Africa Star"". SS "South Africa Star". UK Wherever Possible. Schaefer Beer 14-Ounce Pilsner Glass. 4 Glass Box Set. Half Pint capacity. All 6 tankards show signs of general use and wear. Large 600 ml Glass Tankard. The pint pot holds over a pint (approx 600 ml) so there is room for a good head. STAINLESS STEEL PINT WELSH DRAGON TANKARD PLUS 4 PLASTIC DRAGON BEAKERS. Reads 'Officially The Greatest' with a star below. Presented beautifully in a black and brown retro style card box with black satin effect lining. 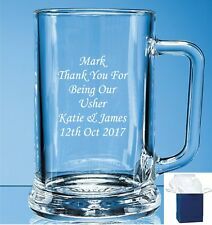 Personalised Cheers Glass Pint Stern Tankard. Celebrate a special occasion in style with this Personalised Cheers! 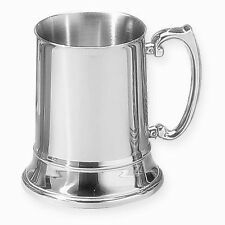 Glass Pint Stern Tankard. 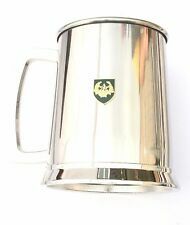 The tankard can be personalised with 3 lines of text, with up to 25 characters per line.